European Repair Centre with well trained engineers, the latest technologies and a high level of quality. Direct pick up from and delivery to the customer, anywhere within the European Union. Some product ranges are repaired at external facilities. For these product ranges the standard leadtimes are not applicable. Please contact your local Omron office for more details. Free repair service for products under warranty as given by Omron. Fixed repair price for products when the repair is not covered by warranty. Repaired products receive a 1-year warranty on any replaced or repaired component, valid from the repair date at the Omron European Repair Centre. The repaired product is returned with our standard repair report. On request an extensive repair report or detailed analysis can be supplied. If you complete the Repair request form we will send you a free quotation for your product. Content of the repair-services are subject to change at any time, without prior notification. Customs procedures may delay repair requests from outside the European Union. Some Omron products do not qualify for this express repair service. 5 simple steps to our 5-day express repair service. If you need a repair, contact your distributor or the local Omron After-Sales service staff. Omron will send you an acknowledgement of your request for a repair and, if applicable a quotation. Make sure the product is securely packed in a box. 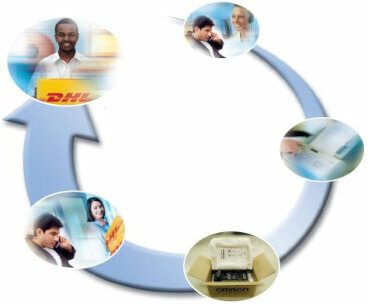 Quote the special OMRON account number and DHL will collect your package. Your repaired and tested product, along with a repair report, is returned within the next five working days! * Note: The 5-day repair service is not available for all Omron products. Please contact your local Omron office for more details.